To Buy a print, please click on any image and then select the Shopping Cart icon to see print options and prices. Panoramic Pictures taken around the USA (Texas, Montana, Colorado, Utah etc). Images include skyline shots of Dallas and New York, pictures from National Parks (Glacier, Grand Teton, Rocky Mountaion, Arches, Canyonlands etc) as well as images from various storm chases I have been on. These images can be purchased by clicking the "Purchase Prints & Downloads Of This Photo" button while viewing the picture. Any of the images in this gallery can be licensed for commercial use. Please Email Me for details. 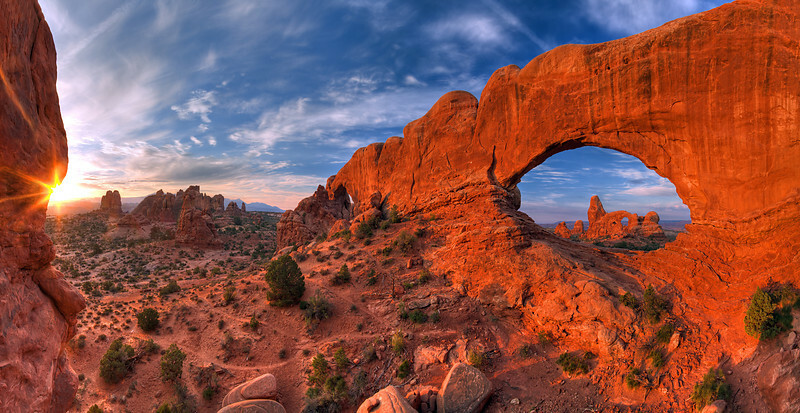 It is possible to capture Turret Arch through The North Windows arch, creating this amazing scene. To get to this location, you have to climb through the North Window and scramble up some rocks. This is one of the best views within Arches National Park, in my opinion. Technical Details: Shot with a Canon 5d Mk2 and a Canon 20mm prime lens at F16. Bracketted images stitched and merged to create a wider dynamic range.